Models are still as popular as ever - here are a couple of suggestions you might like to consider as gifts. 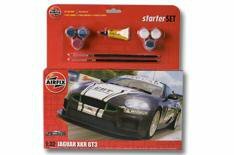 Anyone who's new to model making will find just about everything they need in this kit, which comes with paint and glue to complete the race-liveried Jaguar XKR. Its a great introduction to kit building. Accomplished modellers will want more of a challenge, and thats where these kits come in. Theyre tricky to build, but the instructions are clear and helpful. For the finished look, youll need to splash out on a lot more in the way of paint, so they're best left for those who are regular model builders.